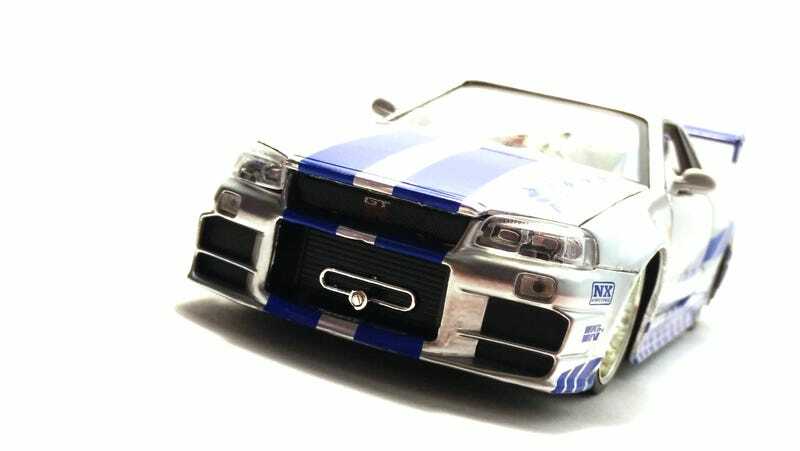 From 2 Fast 2 Furious, this is Brian O’Connor’s Nissan Skyline GT-R R34. This car was featured in the street race scene at the beginning of the movie. O’Connor later went on to drive a green Mitsubishi Evo (which received a lot more screen time), but this Skyline is perhaps the most iconic car of the movie. The iconic blue striping on this car is unmistakable; I wish I had a dollar for every time I saw someone attempt to replicate this livery in a Need For Speed game. This 1/24 uses Jada’s existing R34 casting. Therefore, it’s not exactly movie accurate. The body kit differs from that of the movie car and the wheels are shared with Jada’s other releases. However, I still found this one worthy of a purchase because I’m both a Skyline and a F&F fanboy. The price, at about $15, is not asking too much. It has quite a heavy feel to it compared with Maisto’s 1/24’s. This is my first Jada R34, and I’m very pleased with it. I also feel lucky having been able to find this one in stores in my heavily scalped area. It was hidden at the very back of the F&F 1/24 shelf of Walmart, and I’m glad I made the decision to dig inside there. The details and quality of this piece are about right at this price. Of course, the wheels are exaggerated, but that’s part of Jada’s character. I like that the front and rear foglights are individual plastic parts. The printing is done well and sharp enough for me. The paint has a little bit of orange peel, but so does pretty much all other 1/24’s that cost $15 or less. My only minor complaint is that the edges of the casting are a bit rough. I think this looks most evident in the rear shots of the car, where you can see from the seams between the rear bumper and the rest of the body. Nice, big, double fart-can exhaust. As is consistent with Jada, there are brake discs and calipers behind those wheels. Look, the wheels may be big, but man are they nice. And of course, the hood opens up to reveal the Gallo twel...I mean RB26DETT engine. The interior is simplistic and mostly just black plastic with a few chrome bits. And I’ll end with a few more shots. I’m already looking forward to the continuation of these Jada F&F models. There should be a couple Supras and a Mitsubishi Evo coming soon, as well as another R35 GT-R that was just sneaked today.